Spring Break 2019 at the Oasis Cancun Lite is once again setting up to be the number one Spring Break event anywhere. Headliners are being booked for the weekly concerts and the stage primed for daily contests and events. With recently released promotions, the Oasis Cancun Lite is one of the best travel deals for Spring Break 2019. The Oasis Cancun Resort offers two different options when it comes to booking your Spring Break Vacation. The Oasis Cancun Lite provides and excellent value and caters to Spring Breakers traveling on a budget. Packages starting as low as $595 per person for a 5 night stay, include access to weekly concerts, 24 hour all-inclusive, daily poolside DJ’s, activities and contests. Dine at your choice of 10 restaurants and party at your choice of 10 bars. There is a $30 per person security fee collected at check-in. Combined with cheap airfares from the East Coast, complete Spring Break packages are coming below $1,000 including roundtrip airfare, 5 nights hotel, and transfers. Rates will vary depending on your dates of travel. When staying at The Oasis Cancun Resort, you will be in the center of Cancun’s Spring Break action. The beach offers brilliant white sand looking out on Cancun’s crystal clear waters. Each afternoon the Oasis Beach Club comes alive with DJ’s cranking up the scene. Day beds are available to provide the perfect party headquarters. The pool bars provide a great way to enjoy the awesome weather, keep cool and keep your party going. Each Saturday during March the Oasis Beach Club lights up to the top International DJ’s. 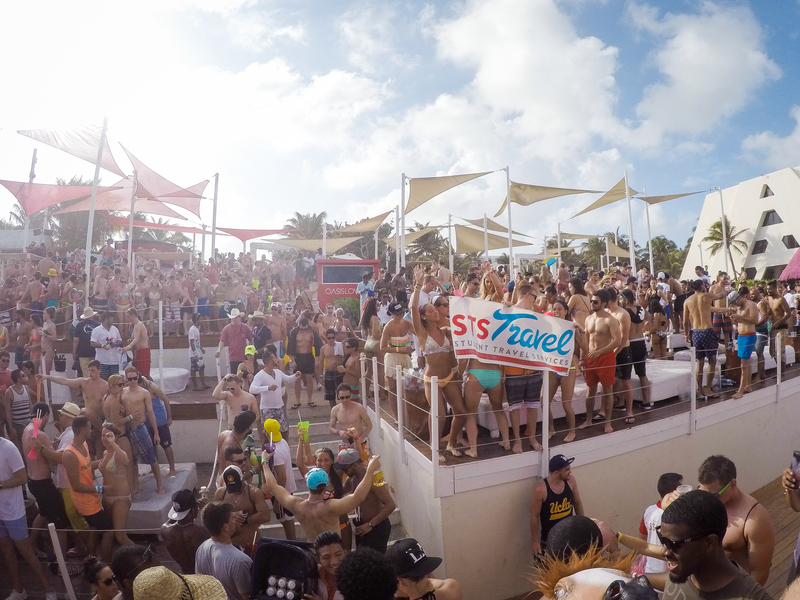 Last year Spring Breakers partied to Carnage, R3Hab, Afrojack and Oliver Heldens. STSTravel enhances your trip by providing onsite staff to meet you upon arrival and assist you through out your stay. The STS Vip Party Package is second to none in providing VIP access to Cancun’s top clubs with express entry and table service. This year’s parties will include Mardi Gras, Foam Parties, Glow Parties and Lingerie. For slightly more, Spring Breakers can upgrade their vacation by staying at the Grand Oasis Cancun. Staying at he Grand Oasis Cancun provides access to additional pools and upscale dining, including restaurants ranked in the top 10 by TripAdvisor. Enjoy access to 19 different bars including the Havana Night Club and Hookahs. Last year I was a staff member during the month of March for Spring Break at Oasis Cancun Lite, so it a simple task for me to give you the inside scoop. Unlike most of the students staying there, my head was a bit clearer when waking up in the morning. Most students begin their day by throwing on a bathing suit and sunglasses to take a stroll through the extensive grounds of the hotel as everyone heads down to the buffet breakfast at the Tatish or Tunkul Buffet. The Oasis resort is HUGE and after staying here for thirty days I still found myself lost at times. Hundreds of other college students surround you and you might even notice some familiar faces from the night before. After eating a full breakfast it is time to head to the room and freshen up or just head directly out to the beach. You don’t want to be late for the daily MTV style parties that rage right by the water at the Oasis Beach Club. They run from sun up to sun down and there is never a dull moment in this energetic crowd of students drinking and dancing the day away. The Sand Bar is right next to the Oasis stage so you’ll see most students gathered around there with their OASIS LOVES U cups and using the all-inclusive wristband to fill those bad boys up. If you’re really lucky it is the day of a major headliner for Oasis Dance U and they will be playing on the mega stage at the Oasis Beach Club in which case the area is PACKED– last year we were graced enough to see Krewella, DVBBS, and Lil Jon (to name a few). You will feel like a true VIP if you’re granted access to one of the day beds that have bottle service. If you get tired of dancing you can always take a dip in the quarter mile long pool that parallels the ocean and swim up to the popular pool bar to chat it up with hundreds of students from other school’s across the globe. The day time gets pretty rowdy as Spring Break at Oasis Cancun Lite offers a one of a kind experience for your Spring Break–complete with crazy snapchats and more stories to tell. If you’re feeling hungry during this marathon its easy to grab some quick, yummy tacos at La Placita snack area outside by the pool or head back to your room if you are feeling as though a power nap is necessary at any point. If you are looking for THE place to stay you are in for a real treat for Spring Break at Oasis Cancun Lite!